Govome4.insppartner.com is the PUP that uses misleading techniques to prevent removal. Use Reimage to locate malicious components and get rid of them faster than with uninstall instructions. A full system scan blocks virus reappearance and prevents traffic to malicious domains. 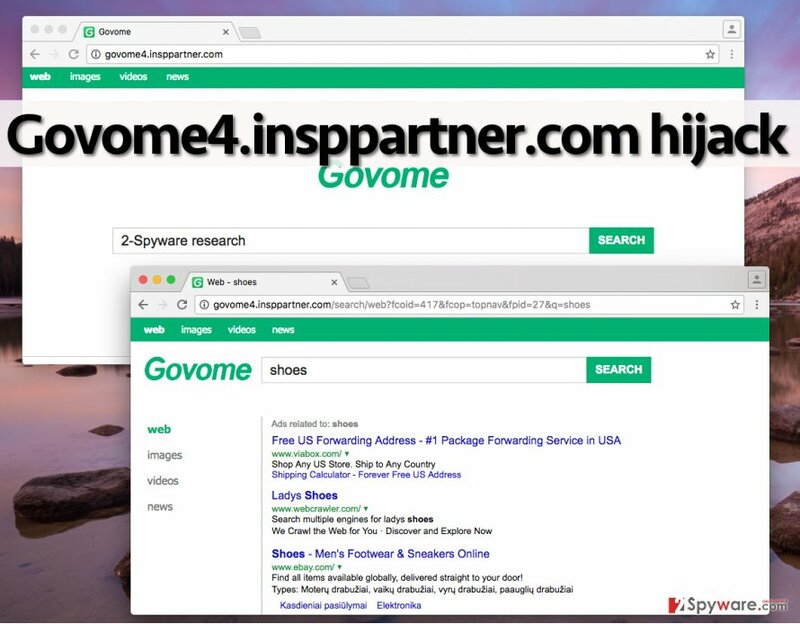 What is known about Govome4.insppartner.com search engine? How does Govome4.insppartner.com hijack the computer? People like to browse the Internet on a daily basis – that is the truth that cannot be denied. However, pests like Govome4.insppartner.com virus can diminish that experience quickly if the user installs it without realizing it. We have digged up some information about Govome and found out that it is a site that provides customized web search service. According to this company, they help businesses promote their products or services by advertising the via search results. This might be useful for some companies, however, users who end up searching via Govome4.insppartner.com might find this search tool annoying. We have attempted to make a search query using this search engine and discovered that it fills up the results page with many sponsored and hardly relevant search outcomes. If you are a user who likes to access required information quickly, you should bypass this search engine. Besides, you should be very careful with it in case it has replaced your homepage address without your knowledge. 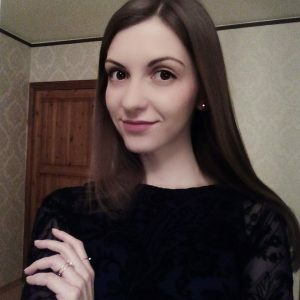 It can happen because this site is promoted with the help of Govome4.insppartner.com browser hijacker, which spreads along other free programs. Users who have experienced the activity of Govome4.insppartner.com redirect virus will understand why we have assigned this label to it. Surprisingly, this hijacker manages to alter search results in a particular way that they can transfer users to completely different websites, which, in some cases, can be completely unrelated to the search result that was clicked. These redirects can pose a threat to your computer safety because they can unexpectedly transfer you to sites that might be dangerous to visit. You might be forced to enter phony sites that suggest fake software updates, free programs, and other files that might be hazardous. Besides, if you ever experience a redirect to a website that raises your suspicious AND asks to provide your personal information, quit it. In other words, although this browser hijacker cannot itself harm your PC, it can create an environment where you can go to dangerous sites by yourself and install dangerous software manually. However, Govome4.insppartner.com removal can solve these problems easily. To carry it out, we suggest using the Reimage software. Govome4.insppartner.com hijack is a problem that cannot be ignored. There are several programs related to this hijacker, which set either govome.com or govome.inspsearch.com as the homepage address. Typically, users do not install such potentially unwanted programs by their choice, so now we are going to teach you how to avoid installing such unwanted apps on the system. The way they enter systems is quite tricky, but if you know how they do it, you can stop them. They tend to travel alongside free applications such as games, media players, download managers, and the like. The secret is that if the user chooses to install such free programs using Default or Standard installation settings, he/she automatically gives permission to install all optional programs together with the main app. To reject unwanted additions, users should adjust components of software via Custom/Advanced settings. If you want to eliminate this hijacker, check your system for apps developed by Big Journey or Govome, Inc. Then check your browsers for extensions associated with these companies. Here, look for Govome4.insppartner.com or any other recently installed suspicious programs. You have to check several locations – Apps folder and each of your web browsers for files or programs related to Big Journey or Govome. Delete them ASAP. Wait until you see Applications folder and look for Govome4.insppartner.com or any other suspicious programs on it. Now right click on every of such entries and select Move to Trash. When in the new window, check Delete personal settings and select Reset again to complete Govome4.insppartner.com removal. Once these steps are finished, Govome4.insppartner.com should be removed from your Microsoft Edge browser. Here, select Govome4.insppartner.com and other questionable plugins. Click Remove to delete these entries. Now you will see Reset Firefox to its default state message with Reset Firefox button. Click this button for several times and complete Govome4.insppartner.com removal. Here, select Govome4.insppartner.com and other malicious plugins and select trash icon to delete these entries. Click Reset to confirm this action and complete Govome4.insppartner.com removal. Here, select Extensions and look for Govome4.insppartner.com or other suspicious entries. Click on the Uninstall button to get rid each of them. Here, look at the Homepage field. If it was altered by Govome4.insppartner.com, remove unwanted link and enter the one that you want to use for your searches. Remember to include the "http://" before typing in the address of the page. Now you will see a detailed dialog window filled with reset options. All of those options are usually checked, but you can specify which of them you want to reset. Click the Reset button to complete Govome4.insppartner.com removal process. This entry was posted on 2016-09-23 at 01:42 and is filed under Stealing programs, Viruses. You can quickly scan the QR code with your mobile device and have Govome4.insppartner.com virus manual removal instructions right in your pocket. How did you remove Govome4.insppartner.com virus?